Commuters and pedestrians in Wolverhampton have until the end of the week to have their say on a new scheme which will allow them to hire a bike for as little as 50p at various locations in the city centre. The new &apos;Bike Share&apos; project will make 2,000 bikes available to members of the public 24 hours a day and create more than 50 new jobs. The initiative is set to be rolled out across other parts of the West Midlands in 2019. A public consultation into the project began last month, with planned bicycle bays located at the Britannia Hotel, Civic Centre, the New Market, Sainsbury&apos;s on the Ring Road, Compton Road, Magistrates Court, Molineux, The Way, West Park, St John&apos;s and St George&apos;s.
Since then the council&apos;s highways bosses have been encouraging the public to give their opinions on the locations of the proposed cycle bays across the city. A spokesman for Wolverhampton Council said: "The consultation with the public officially closes this Friday. Anyone requiring more information should visit the Civic Centre or go online at nextbike.co.uk/westmidlands. To take part in the consultation email bikeshare@wolverhampton.gov.uk". Leader of Wolverhampton City Council, Councillor Roger Lawrence (Lab. St Peter&apos;s) said: "Cities like Amsterdam and towns right across Europe have schemes such as this and use it as a unique way of cutting congestion and driving up participation in cycling. "It&apos;s high time we had a similar thing in the West Midlands and I am delighted that Wolverhampton, will be among the first places to see the bikes in action. We will be creating more than 50 new jobs across the area and we will be partnering with the Walsall-based &apos;Steps to Work&apos; charity to help fill the roles. "They work with long-term unemployed and young people currently not in education or employment amongst others, and these are groups that we are passionate about reaching, retraining and recruiting." Annual membership to the scheme will cost just £30 per year, meaning riders can access bikes for as little as 8p per day. Operated by nextbike UK, which also runs several other schemes in the UK as well as internationally, the West Midlands bike share project will expand across Birmingham, Solihull, the Black Country and Coventry next year with 3,000 more bikes becoming available. 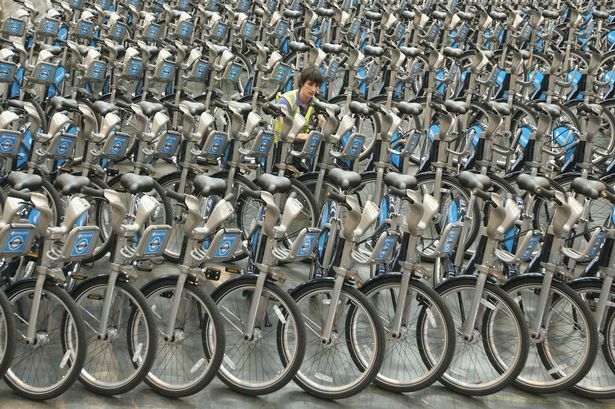 Managing Director of nextbike UK, Julian Scriven, said the scheme would be the "most technologically-advanced and forward-thinking bike-share in the UK".